Soweto's history goes back to 1903, when Kliptown was established as the first black settlement on the outskirts of Johannesburg. An abbreviation for South-Western Township, Soweto has had a turbulent history and was at the centre of the Apartheid struggle in South Africa. The ANC and other organisations adopted the Freedom Charter in Kliptown in 1955, and the Soweto Uprising of 1976 was one of the pivotal events in the struggle. Soweto is home to several famous landmarks, including Chris Hani Baragwanath Hospital in Diepkloof, Walter Sisulu Square in Kliptown, Regina Mundi Catholic Church in Rockville, and the Freedom Towers. In Orlando, tourists can visit Vilikazi Street, which is the only street in the world to have been the home of two Nobel Peace Prize winners (Nelson Mandela and Archbishop Desmond Tutu). On the streetm, Mandela House has been restored to the state it was in when the former president lived there. A number of historic museums are also popular attractions in Soweto, including the Hector Pieterson Museum, the Kliptown Open-Air Museum, and the Apartheid Museum. 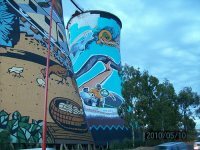 A fun and popular Soweto Attraction is the Orlando Cooling Towers. Part of a decommissioned coal-fired power station, the towers have been brightly painted and offer rap jumping opportunities. Tours of Soweto are a must for any first-time visitor to Johannesburg and South Africa, and a number of tour operators offer trips into Soweto. The most popular are the historical tours, stopping at museums and famous sites, and the nightlife tours, which include stops at local shebeens (township bars). Soweto is also home to some excellent restaurants, ranging from five-star establishments to holes-in-the-wall, which serve local African cuisine. Although many tourists have concerns about whether it's safe to visit Soweto, most visits are completely trouble-free when organised by a reputable tour operator.